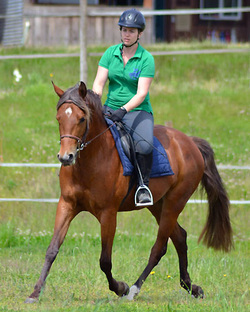 In August 2012, Khepri TDS, a 2008 bay silver ApHC mare was presented to ISR/Oldenburg N.A. for breeding approval. She earned a 105 point score - a premium score, however, is entered in the Pre-Mare book due to only having 33.5% (TB/Arab) approved blood. 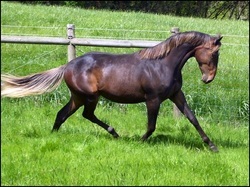 In August 2011, Safyre, a 2008 brown silver AQHA appendix mare was presented to ISR/Oldenburg N.A. for breeding approval. She earned 102 pts and was entered into the Mare Book because she has 58.5% TB blood. *** These two mares are 1/2 sisters and share the same sire, Champs Guthrie. Another 1/2 sister, Montana, was also presented in 2012 for approval and received a 102 score. Both Safyre & Khepri (above) will be bred to Dreamscape Farm's 16.3 hh stallion, Diamond Stud (Diamond Hit x Lavarino x Rohdiamant) for 2014 foals. Foals will be registered with ISR / Oldenburg N.A.